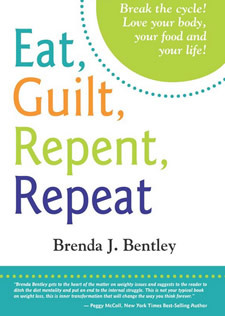 Eat, Guilt, Repent, Repeat is a guide to help you discover the core issues behind weight gain and disordered eating. Author, Brenda J. Bentley is a therapist, originally from Florida, who now works in private practice in England. Through her personal weight loss and healing journey her work was transformed. After losing over 104 pounds, she became motivated to help others change their lives by healing their relationship with food. This is not a diet book in the conventional sense because you won’t find food recommendations, meal plans or exercise regimes. Rather this program will equip you with tools, strategies and techniques to help you gain control of your eating habits for good. You are stuck in a cycle of yo-yo dieting. You feel like a failure when you can’t stick with a diet. You are constantly starting a diet “tomorrow”. You overeat or binge in response to stress. Bentley asserts that if weight gain were strictly a physical problem then diets would be effective. However, we know from experience that this is not the case. Diets can offer a quick-fix solution but unless we deal with the real causes the weight returns. She explains that weight gain is generally a symptom of unresolved emotional patterns or habitual behaviors. The purpose of Eat, Guilt, Repent, Repeat is to change your life by teaching you transformational concepts and principles. After years of dieting most people develop a distorted and disordered eating approach. If you have been restricting and depriving yourself, you are encouraged to reevaluate your relationship with food. Healing yourself and achieving your goals will require redefining the way you think about food and your eating behaviors. Rather than being something to fear or control, you need to look at food as a source of nourishment to support your health. A companion workbook and audio recordings can be used to support your progress. These are available for an additional fee at the author’s website. These tools can help to ground the principles that you learn in the book into practical experience. The book focuses on addressing the excuses you make that stop you from exercising regularly. It is essential to realize that exercise can feel good, instead of regarding exercise as punishment for being overweight. Eat, Guilt, Repent, Repeat : Break the cycle! Love your body, your food and your life! retails at $11.99. Also available is the Companion Workbook + Full Audio Toolkit set for $50. Addresses the psychological reasons why many people struggle to lose weight. Encourages self-acceptance and building a positive self-esteem. Can help break the cycle of yo-yo dieting. Emphasizes health rather than simply losing weight. Supportive resources are available online for an additional fee. Does not include meal plans or dietary recommendations. Most dieters require at least some guidance on healthy weight loss foods. Won’t appeal to dieters looking for a general weight loss plan. Will probably take some time for weight loss to occur. Eat, Guilt Repent, Repeat focuses on helping you discover the emotional and mental blockages to long-term weight loss. It does not include advice on what to eat but concentrates on changing the way you think about food and your body. This program can help you break the cycle of yo-yo dieting by healing emotional traumas and developing a positive self-esteem.